Most prostate cancers (PCas) are classified as acinar type (conventional) adenocarcinoma which are composed of tumor cells with luminal differentiation including the expression of androgen receptor (AR) and prostate-specific antigen (PSA). There are also scattered neuroendocrine (NE) cells in every case of adenocarcinoma. The NE cells are quiesecent, do not express AR or PSA, and their function remains unclear. We have demonstrated that IL8-CXCR2-P53 pathway provides a growth-inhibitory signal and keeps the NE cells in benign prostate and adenocarcinoma quiescent. Interestingly, some patients with a history of adenocarcinoma recur with small cell neuroendocrine carcinoma (SCNC) after hormonal therapy, and such tumors are composed of pure NE cells that are highly proliferative and aggressive, due to P53 mutation and inactivation of the IL8-CXCR2-P53 pathway. The incidence of SCNC will likely increase due to the widespread use of novel drugs that further inhibit AR function or intratumoral androgen synthesis. A phase II trial has demonstrated that platinum-based chemotherapy may be useful for such therapy-induced tumors. Prostate cancer (PCa) is the most commonly diagnosed malignancy and the second leading cause of cancer-related death in western countries. Its incidence is also increasing rapidly in countries such as China where PCa had traditionally been considered relatively uncommon. Low-grade, organ-confined PCa is curable by surgery or radiation therapy. When local therapies can no longer be used in patients with advanced or metastatic PCa, hormonal therapy, by inhibiting androgen production and/or blocking androgen receptor (AR) function, is the treatment of choice. The molecular basis for hormonal therapy is that PCa is a hormonally-regulated cancer. Tumor cells express AR and androgen is required for the survival of tumor cells. As a result, hormonal therapy achieves therapeutic effect in nearly all patients. Unfortunately, this therapy is not curative and the cancer nearly always recurs after an initial period of response. The recurrent tumor after hormonal therapy is known as castration resistant prostate cancer (CRPC). Detailed histologic and molecular studies of CRPC have rarely been performed because biopsy or resection is rarely performed in such a clinical setting. Nonetheless, CRPC is still a form of adenocarcinoma and the tumor cells still show nuclear localization of AR and PSA production, suggesting that AR signaling is still active and likely critical at this stage of the disease. , A smaller percentage of patients will recur with small cell neuroendocrine carcinoma (SCNC) which has a different phenotype. Because most CRPCs still appear to be AR-driven, newer agents have been developed to inhibit intratumoral androgen production (e.g. abiraterone acetate)  or more effectively block AR function (e.g. enzalutamide)  and they have shown clinical benefits by extending survival in patients who have exhausted therapeutic options. Despite their proven efficacy, resistance to these drugs occurs quickly  and more importantly, a significant portion of the patients recur with SCNC. In this review article, we will discuss the cellular heterogeneity of benign prostate and PCa, and the potential molecular mechanisms and therapeutic options for therapy-induced SCNC. The prostate gland is an epithelial organ composed of epithelia and stroma [Figure 1]a. The stroma is complex consisting of smooth muscle cells, fibroblasts, blood vessels, nerves, inflammatory cells and so on. The pioneering work from Dr. Cunha's laboratory has demonstrated that stroma plays a critical role in the development, function, and carcinogenesis of the prostate. , The epithelial compartment of the prostate has three cell types: (i) secretory cells (or luminal cells) that produce secreted proteins including prostate-specific antigen (PSA), (ii) basal cells that likely function as reserve cells and (iii) neuroendocrine (NE) cells ,, that have neuronal morphology and endocrine function. The NE cells are a minor component of the prostate epithelia and comprise no more than 1% of the total epithelial cell population. They contain intracytoplasmic dense-core secretory granules under electron microscopy. It is difficult to identify NE cells on hematoxylin and eosin stained slides under light microscopy. Immunohistochemistry (IHC) with antibodies against NE markers such as chromogranin A, synaptophysin or CD56 can be used which demonstrates the presence of the scattered NE cells among the more abundant basal and luminal cells. ,, NE cells are also present in mice. However, unlike the wide distribution pattern seen in human prostate, NE cells are concentrated around the proximal urethra of the mice, but are not commonly seen in the different prostate lobes. The consistent presence of NE cells in every human prostate suggests that they likely play important roles in prostate development and function. However, little detail is known regarding their function. 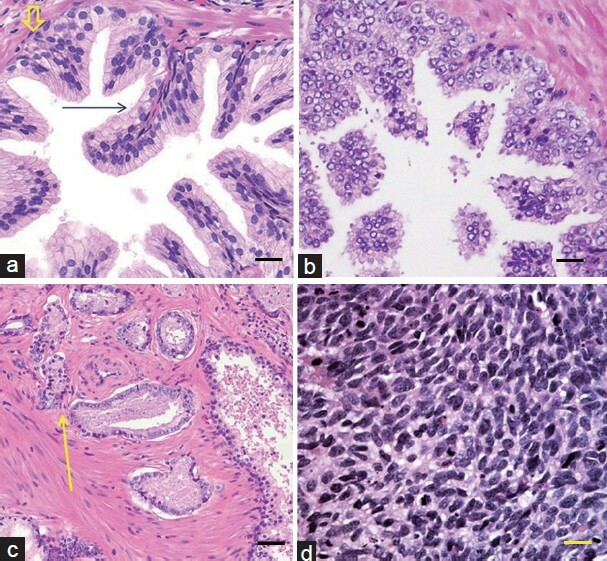 Figure 1: Histologic features of benign prostate gland, high grade PIN, adenocarcinoma and SCNC. ( a ) A high power view of benign prostate gland showing an inner luminal cell layer (long arrow) and an outer basal cell layer (short arrow). ( b ) High grade PIN showing malignant luminal cells without invasion of the stroma. ( c ) Prostatic adenocarcinoma showing proliferation of small, compact malignant glands (arrow). ( d ) SCNC which is composed of pure NE tumor cells without glandular formation. NE: neuroendocrine; PIN: prostatic intraepithelial neoplasia; SCNC: small cell neuroendocrine carcinoma. Although the vast majority of malignancies seen in the prostate are prostatic acinar type adenocarcinomas, occasionally tumors composed of pure NE cells are encountered clinically. The most common type of NE tumor is classified as SCNC with histologic features quite different from those of adenocarcinoma [Figure 1]d. ,, In contrast to adenocarcinoma that forms glandular structures, SCNC grows as individual cells, cords or solid sheets. While cells of adenocarcinoma have abundant cytoplasm, relatively low nucleus/cytoplasm ratio, vacuolated nuclei with coarse chromatin pattern and prominent nucleoli, those of SCNC have scant cytoplasm, high nucleus/cytoplasm ratio, fine chromatin pattern and no nucleoli. SCNC also tends to have frequent mitotic figures and areas of necrosis, which are rarely seen with adenocarcinoma. 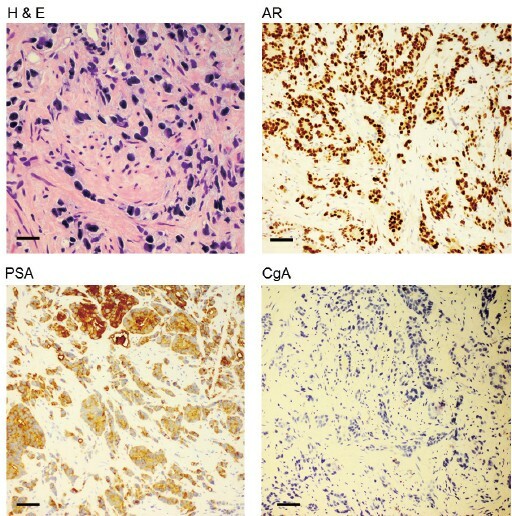 Immunohistochemically, adenocarcinoma is characterized by the expression of luminal differentiation markers such as CK8, CK18, AR and PSA [Figure 2], while SCNC shows focal, perinuclear staining pattern for cytokeratin, negative staining for AR and PSA and positive staining for NE markers chromogranin A [Figure 2], synaptophysin and CD56. ,, SCNC is also positive for P53  and CD44,  and occasionally TTF-1. ,,, However, in daily clinical practice, we have encountered cases that have only some of the histological and immunohistochemical features of SCNC as described above. Some cases with classic morphology of SCNC are negative for all the NE markers [Figure 3], while other cases that have histologic features in between adenocarcinoma and SCNC express NE markers strongly and diffusely. Such variations can cause difficulties and inconsistencies in pathologic diagnosis. Figure 2: Immunohistochemical characteristics of prostatic adenocarcinoma vs SCNC. 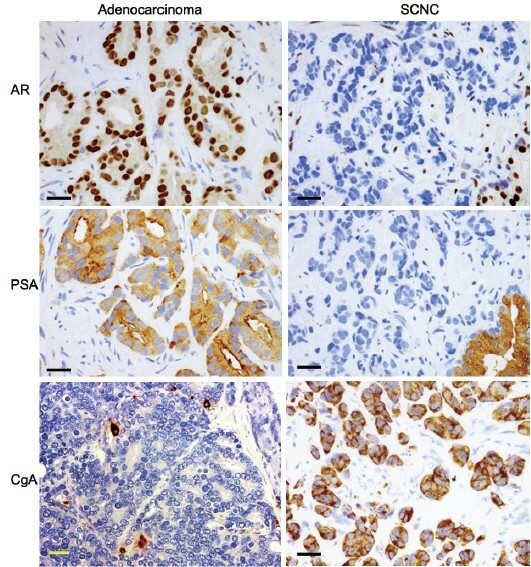 Adenocarcinoma expresses luminal differentiation markers AR and PSA. Tumor cells are negative for NE marker CgA. SCNC is negative for AR and PSA, but expresses CgA. AR: androgen receptor; CgA: chromogranin A; NE: neuroendocrine; PSA: prostate-specific antigen; SCNC: small cell neuroendocrine carcinoma. Figure 3: Some treated prostate cancers have classic morphology for SCNC, but not typical IHC profile. The case demonstrates histologic features of SCNC in that tumor cells do not form glandular structures. They are small with scant cytoplasm, darkly-stained nuclei with homogeneous chromatin pattern and no nucleoli. However, the tumor cells still express luminal differentiation markers AR and PSA and negative for NE marker CgA. AR: androgen receptor; CgA: chromogranin A; H and E: hematoxylin and eosin; IHC: immunohistochemistry; NE: neuroendocrine; PSA: prostate-specific antigen; SCNC: small cell neuroendocrine carcinoma. At least some of the cases with strong expression of NE markers, but morphologically imperfect for SCNC may be classified as large cell neuroendocrine carcinoma, which is very rarely diagnosed pathologically. The largest series of large cell neuroendocrine carcinoma was reported by Evans et al. who collected seven cases. Histologically, large cell neuroendocrine carcinoma contained solid sheets and ribbons of cells with abundant pale to amphophilic cytoplasm, large nuclei with coarse chromatin and prominent nucleoli along with brisk mitotic activity and foci of necrosis. Their cases were strongly positive for CD56, CD57, chromogranin A, synaptophysin and P504S/alpha methylacyl CoA racemase. They also exhibited strong bcl-2 overexpression, expression of MIB1, and p53 in > 50% of nuclei, as well as focally positive staining for PSA and prostatic acid phosphatase and negative AR staining. Six of six patients with available follow-up information died with metastatic disease at a mean of 7 months after platinum-based chemotherapy,  suggesting a clinical behavior similar to SCNC. We have seen in consultation a case of carcinoid tumor (well-differentiated NE carcinoma) that is morphologically identical to carcinoid tumors seen in lung or the gastrointestinal tract. The patient was found to have a firm nodule on digital rectal exam, but had low serum PSA levels. Prostate biopsy showed that the tumor was composed of round and regular NE cells growing in a nested and tubular pattern. No mitotic figures or necrosis were present. The tumor quickly metastasized to bilateral lungs with numerous small nodules. NE differentiation is a unique feature of PCa, particularly after treatment targeting androgen production or AR signaling. We must differentiate between adenocarcinoma with focal NE cells from SCNC. The former is fundamentally an adenocarcinoma with luminal differentiation which should respond to hormonal therapy. The number of NE cells in adenocarcinoma varies from case to case but these cells are quiescent and their prognostic role remains uncertain. Conversely, SCNC is a tumor composed of aggressive and highly proliferative NE cells which does not respond to hormonal therapy and should be treated with chemotherapy. We discourage using the term 'neuroendocrine carcinoma' because it can potentially mix adenocarcinoma containing abundant NE cells with SCNC. With the widespread use of novel androgen axis-targeting drugs such as abiraterone acetate and enzalutamide, we have already witnessed a rapid rise in the incidence of SCNC which will become a main challenge in managing these patients. Therefore, studying the molecular mechanisms, recognizing the disease early and accurately, and developing novel therapies for SCNC remain important tasks for PCa researchers. 1. Scher HI, Sawyers CL. Biology of progressive, castration-resistant prostate cancer: directed therapies targeting the androgen-receptor signaling axis. J Clin Oncol 2005; 23: 8253−61. 2. Mitsiades N. A road map to comprehensive androgen receptor axis targeting for castration-resistant prostate cancer. Cancer Res 2013; 73: 4599−605. 3. Hagood PG, Johnson FE, Bedrossian CW, Silverberg AB. Small cell carcinoma of the prostate. Cancer 1991; 67: 1046-50. 4. Ferraldeschi R, de Bono J. Agents that target androgen synthesis in castration-resistant prostate cancer. Cancer J 2013; 19: 34-42. 5. Rathkopf D, Scher HI. Androgen receptor antagonists in castration-resistant prostate cancer. Cancer J 2013; 19: 43-9. 6. Yuan X, Cai C, Chen S, Yu Z, Balk SP. Androgen receptor functions in castration-resistant prostate cancer and mechanisms of resistance to new agents targeting the androgen axis. Oncogene 2013 Jun 10. [Epub ahead of print]. 7. Beltran H, Tagawa ST, Park K, MacDonald T, Milowsky MI, et al. Challenges in recognizing treatment-related neuroendocrine prostate cancer. J Clin Oncol 2012; 30: e386-9. 8. Cunha GR, Ricke WA. A historical perspective on the role of stroma in the pathogenesis of benign prostatic hyperplasia. Differentiation 2011; 82: 168-72. 9. Cunha GR, Hayward SW, Wang YZ. Role of stroma in carcinogenesis of the prostate. Differentiation 2002; 70 : 473-85. 10. Sun Y, Niu J, Huang J. Neuroendocrine differentiation in prostate cancer. Am J Transl Res 2009; 1: 148-62. 11. Yuan TC, Veeramani S, Lin MF. Neuroendocrine-like prostate cancer cells: neuroendocrine transdifferentiation of prostate adenocarcinoma cells. Endocr Relat Cancer 2007; 14: 531-47. 12. Vashchenko N, Abrahamsson PA. Neuroendocrine differentiation in prostate cancer: implications for new treatment modalities. Eur Urol 2005; 47: 147-55. 13. Merrimen JL, Evans AJ, Srigley JR. Preneoplasia in the prostate gland with emphasis on high grade prostatic intraepithelial neoplasia. Pathology 2013; 45: 251-63. 14. Huang J, Yao JL, di Sant'agnese PA, Yang Q, Bourne PA, et al. Immunohistochemical characterization of neuroendocrine cells in prostate cancer. Prostate 2006; 66: 1399-406. 15. Yao JL, Madeb R, Bourne P, Lei J, Yang X, et al. Small cell carcinoma of the prostate: an immunohistochemical study. Am J Surg Pathol 2006; 30: 705-12. 16. Wang W, Epstein JI. Small cell carcinoma of the prostate: a morphologic and immunohistochemical study of 95 cases. Am J Surg Pathol 2008; 32: 65-71. 17. Chen H, Sun Y, Wu C, Magyar CE, Li X, et al. Pathogenesis of prostatic small cell carcinoma involves the inactivation of the P53 pathway. Endocr Relat Cancer 2012; 19: 321-31. 18. Simon RA, di Sant'Agnese PA, Huang LS, Xu H, Yao JL, et al. CD44 expression is a feature of prostatic small cell carcinoma and distinguishes it from its mimickers. Hum Pathol 2009; 40: 252-8. 19. Agoff SN, Lamps LW, Philip AT, Amin MB, Schmidt RA, et al. Thyroid transcription factor-1 is expressed in extrapulmonary small cell carcinomas but not in other extrapulmonary neuroendocrine tumors. Mod Pathol 2000; 13: 238-42. 20. Evans AJ, Humphrey PA, Belani J, van der Kwast TH, Srigley JR. Large cell neuroendocrine carcinoma of prostate: a clinicopathologic summary of 7 cases of a rare manifestation of advanced prostate cancer. Am J Surg Pathol 2006; 30: 684-93. 21. Nadig SN, Deibler AR, El Salamony TM, Hull GW, Bissada NK. Small cell carcinoma of the prostate: an underrecognized entity. Can J Urol 2001; 8: 1207-10. 22. Nguyen-Ho P, Nguyen GK, Villanueva RR. Small cell anaplastic carcinoma of the prostate: report of a case with positive urine cytology. Diagn Cytopathol. 1994; 10: 159-61. 23. Okada H, Gotoh A, Ogawa T, Arakawa S, Ohbayashi C, et al. Two cases of small cell carcinoma of the prostate. Scand J Urol Nephrol 1996; 30: 503-8. 24. Oesterling JE, Hauzeur CG, Farrow GM. Small cell anaplastic carcinoma of the prostate: a clinical, pathological and immunohistological study of 27 patients. J Urol 1992; 147: 804-7. 25. Huang J, Yao JL, Zhang L, Bourne PA, Quinn AM, et al. Differential expression of interleukin-8 and its receptors in the neuroendocrine and non-neuroendocrine compartments of prostate cancer. Am J Pathol 2005; 166: 1807-15. 26. Beltran H, Rickman DS, Park K, Chae SS, Sboner A, et al. Molecular characterization of neuroendocrine prostate cancer and identification of new drug targets. Cancer Discov 2011; 1: 487-95. 27. Lapuk AV, Wu C, Wyatt AW, McPherson A, McConeghy BJ, et al. From sequence to molecular pathology, and a mechanism driving the neuroendocrine phenotype in prostate cancer. J Pathol 2012; 227: 286-97. 28. Palmgren JS, Karavadia SS, Wakefield MR. Unusual and underappreciated: small cell carcinoma of the prostate. Semin Oncol 2007; 34: 22-9. 29. Beltran H, Tagawa ST, Park K, Macdonald T, Milowsky MI, et al. Challenges in recognizing treatment-related neuroendocrine prostate cancer. J Clin Oncol 2012; 30: e386-9. 30. Aparicio AM, Harzstark AL, Corn PG, Wen S, Araujo JC, et al. Platinum-based chemotherapy for variant castrate-resistant prostate cancer. Clin Cancer Res 2013; 19: 3621−30.